In the age of education technology, we have the ability to measure the progress and impact of learning efforts and technologies within the classroom. Leveraging the power of big data has always been central to our mission at BridgeU; we live at the intersection between secondary school/K12 and higher education, which puts us in a unique position to understand how universities admit applicants, and to feed this insight back to our partner schools to better inform their guidance processes. At BridgeU, there are two parts to what we call Analytics: Reporting and Insight. Reporting is more tactical, while insights are more strategic. Reporting provides immediate information on the progress of an admissions cycle, while insights help teachers and advisors understand wider trends, which can then inform a better guidance processes. Which universities, courses or programs are my students considering or ultimately applying to? Which career pathways or industry profiles are my students interested in? Are my students engaged in the guidance process? Who might need some additional support? Based on where my students intend to apply, what set of requirements and deadlines do I need to make sure we are working to? Which teachers do I need to chase up to complete references or letters of recommendation? How many essays/personal statements have my students started or completed? Ultimately: what does my workload look like at any given moment in time? As students progress through the early stages of discovering, exploring and researching post-secondary options, Applications Reporting allows you to see the options they’re considering, so that you can best advise and support them. This allows you to see the complete picture of where all your students are applying, and to monitor changes in real time. You can filter by destination, graduation year, advisor, or custom labels (e.g. Law or medicine; Oxbridge applicants) to devise a plan of action/support for specific students or groups. Something you’ll want to check at this point is that your students are applying to universities or courses where they have a realistic chance of acceptance. This is where Academic Reporting on BridgeU comes in handy. 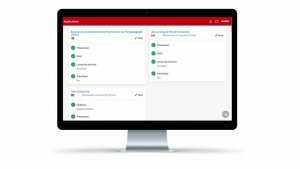 It allows you to access broad academic data on students, including predicted grades, GPA per student and class, SAT/ACT scores, and TOEFL/IELTS. Once your students have applied, the next part of the puzzle is tracking the outcomes of those applications and where students ultimately choose to attend. This type of reporting provides key information to share with senior management and governing boards. This is often seen by schools (and many parents) as the key performance indicator for the university guidance department within a secondary school. Over multiple applicant cycles, you will build up a database of historical applicant data, which can be used to help guide students’ decision-making. We help you make valuable use of this historical data by displaying it in a scattergram format, which shows, for a specific university or group of universities, your school’s historical track record, both with admitted and rejected students. In order to keep guidance processes at busy schools functioning well, reporting is crucial for providing up-to-the minute information. But at BridgeU, we believe that analytics should go beyond that. We strive to make sure our partner schools can extract meaningful insights from their data, creating a valuable learning opportunity for the school moving forward. And while Insights give our partner schools a clearer picture of admissions in context, they also enable us to provide understanding, grounded in data, to the global community of many many hundreds of BridgeU schools and tens of thousands of students and teachers with whom we work. Storing and visualising historical application data allows for meaningful comparisons of year-on-year performance for BridgeU schools. In Insights, you can also track against particular goals: for example, we know from talking to our partner schools that diversifying the number of universities and programs that students apply to, and diversifying the geographic spread of those universities is a key goal for many university and careers guidance departments. 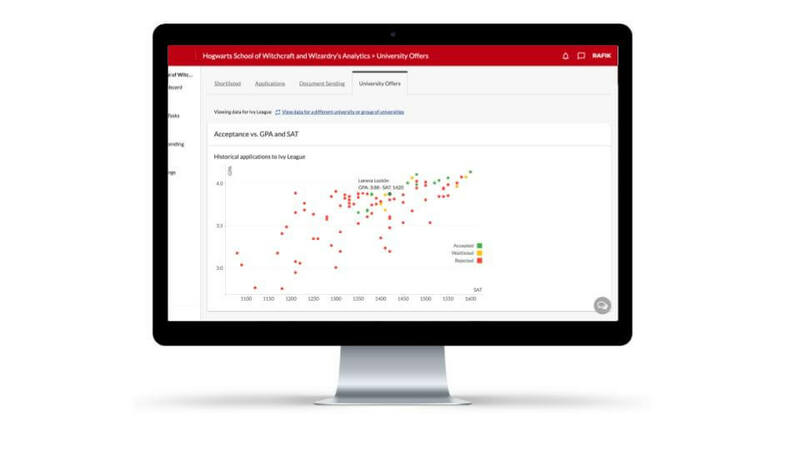 Insights allows schools to see if this diversification is happening year-on-year, and to compare cohort performance for geographic diversity. 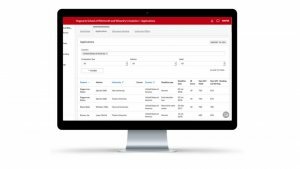 Another key indicator that schools use for measuring the performance of university and careers guidance processes is the offer rate at particular universities and university groups – Insights allows you to track offer rates over time and measure against local, national, and global averages. Insights are also crucial for performance improvements. 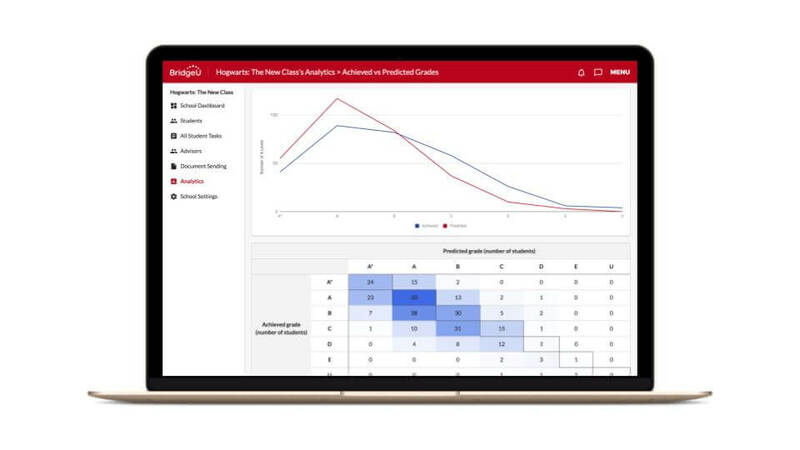 With BridgeU, you can track achieved vs. predicted grades, crucial for showing how consistent predictions are across your school, and for identifying any recurring outliers. Insights also tracks school admission rates relative to averages, gender differences in aspiration, and provides overview, as well as detail, into student global mobility. In order to make sensible comparisons, we know that schools need their own historical data, but they also need to be able to compare their students’ results to local and global admissions trends. This requires access to data that most schools can’t get hold of – which is where BridgeU comes in. Our External Insights can benchmark your school against relevant peer groups, such as showing how your performance compares with other UK independent schools, or IB schools in China, for example. We can perform this analysis, and provide guidance on using benchmarking in your own marketing and reporting efforts, to help distinguish your school in highly competitive markets. We rely on data to make many of our decisions in the modern world. We have a greater capacity now than at any time in history to synthesise, process, and use data to drive our decisions. It’s crucial that schools are empowered to take advantage of that capacity; platforms for university and careers guidance must enable their partner schools to utilise their student and teacher data to refine and improve their internal processes. 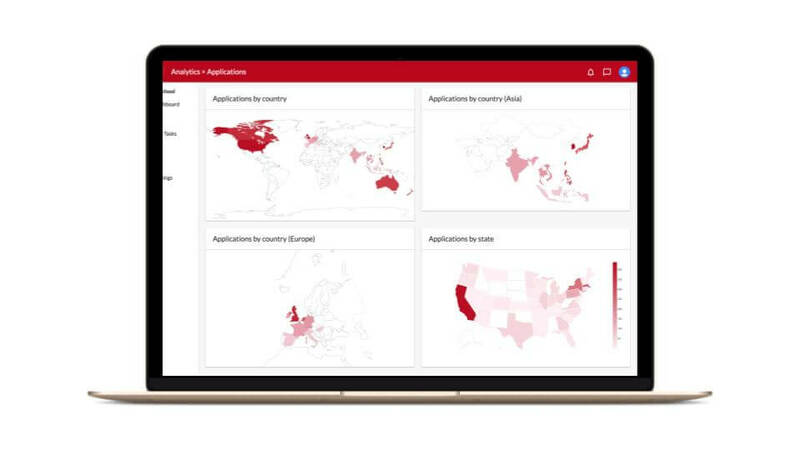 As we continue to build a guidance solution that truly works for schools in the long term, BridgeU will always be focused on helping schools to make the most of their data.